The Flash's second season debuts October 6th on the CW so I thought I would take advantage of that by bringing to your attention a comic book based on the original Flash TV series from 1990. The series debuted on CBS September 20, 1990 with a two-hour pilot. The series starred John Wesley Shipp as Barry Allen/The Flash and Amanda Pays as Tina McGee. Originally scheduled to run opposite NBC powerhouse The Cosby Show, The Flash was placed immediately on life support as Cosby continued his reign of popularity and FOX moved their up-and-coming animated series The Simpsons to the same slot. CBS moved The Flash back thirty minutes and was even moved off of Thursdays within a few weeks. The Flash was able to enjoy a full 22-episode season but was not renewed for a second season. Today, Shipp and Pays can be seen in recurring roles on the CW series. 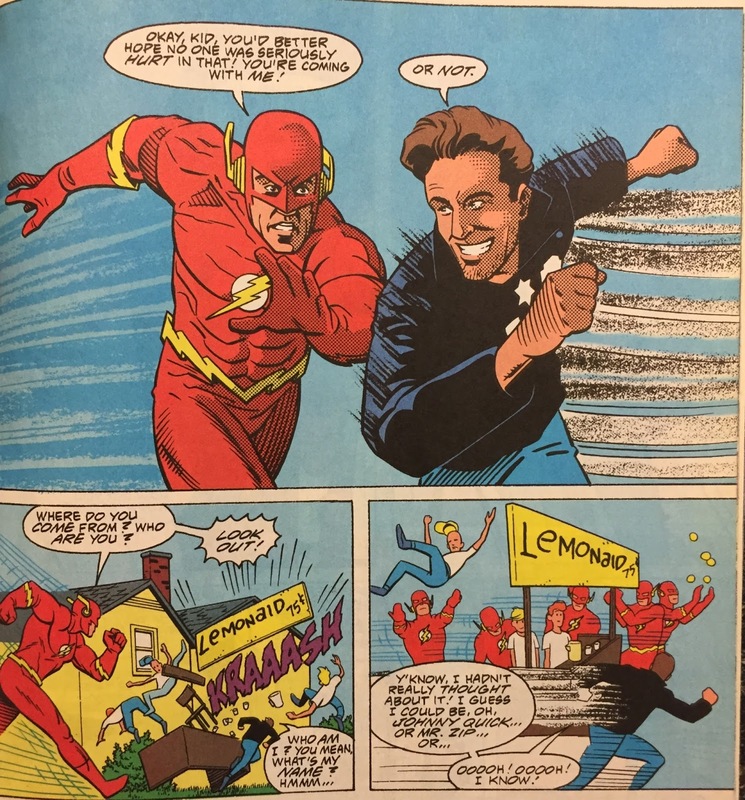 The comic book, The All-New Flash TV Special #1, was published in 1991 by DC Comics. It features two stories, "The Quick and the Dead" by John Byrne and Javier Saltares and "Meet Kid Flash" by Mark Waid, David Williams, Darick Robertson and Gary Martin. "Meet Kid Flash" opens with The Central City Police Department unable to bring in a lowly street punk named Vince Everett. Everett has even gone so far as to steal badges from those trying to apprehend him. With the entire CCPD looking for him, Everett decides that he needs something to protect him so he breaks into S.T.A.R. Labs in hopes of stealing an armor to make him bulletproof or something. 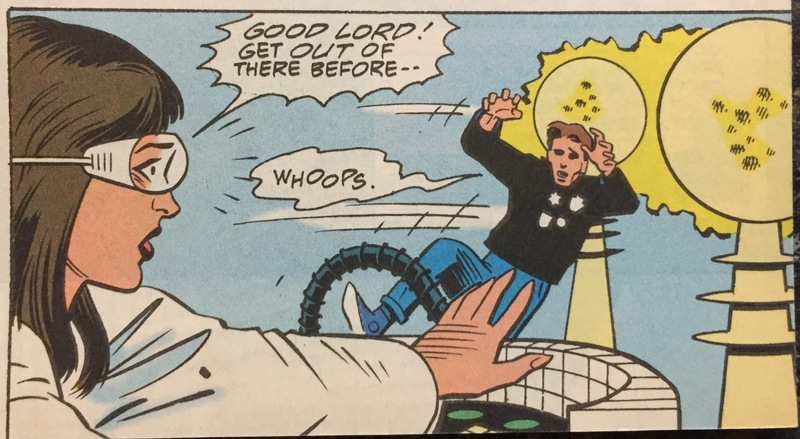 Instead, what happens is he gets himself in the middle of a reenactment of what happened when Barry got his powers. It's not even clear how that happened, Everett just kind of tips over into it. "Oh, no! I've forgotten how to walk for a split second. This is the end of meeee!!" 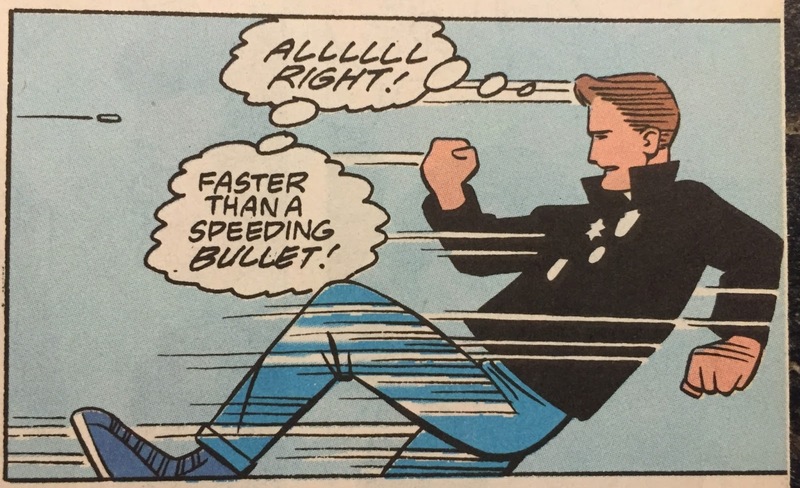 The electricity and chemicals give Everett the exact powers of Barry Allen which allows him to outrun the bullets fired by the S.T.A.R. Labs guards. That saying is taken, punk. 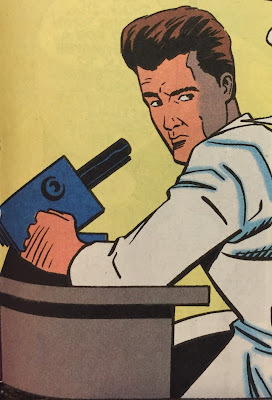 When Barry gets wind of this new Flash-like person, he runs off to investigate and Everett runs circles around him. 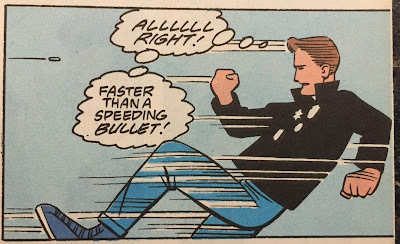 Everett even mocks Barry by trying on new personas like Johnny Quick and Mr. Zip but ultimately decides on Kid Flash and steals Barry's Flash insignia as a reward for getting away. Vince Everett clearly has no respect for job creators. After sewing a new logo on his suit, Barry devises a new plan to stop Everett. Meanwhile, Everett is going on a speed-ridden crime spree and proudly displays his badges on his leather jacket. 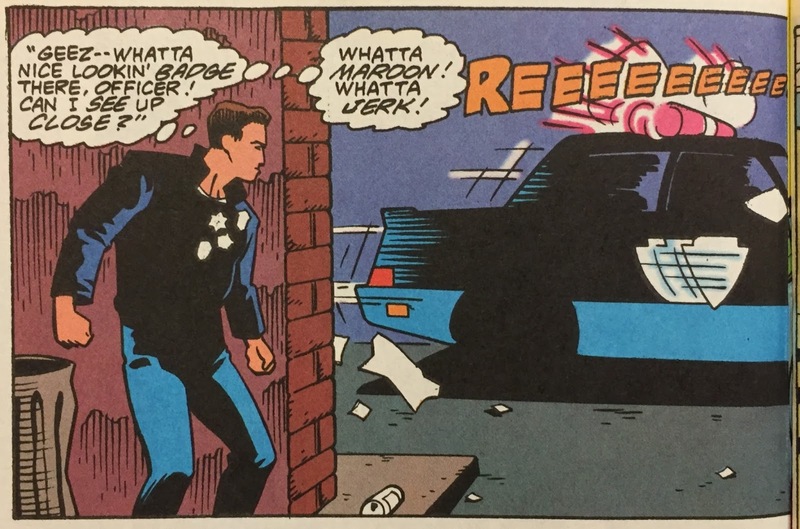 He robs a jewelry store in the white space between the panels and even drops the pants of several officers having some sort of lunch at a hotel and steals 23 of their badges. The Flash then shows up again to apprehend Everett and I get the feeling that most of this story is just filler. We see Barry at "work" doing something with a microscope and computer and The Flash battling a building fire along with several panels devoted to the supporting cast of the TV show. 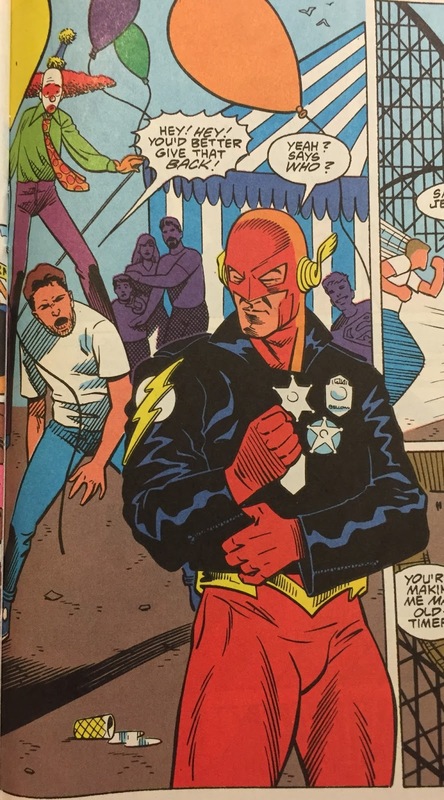 The Flash ends up chasing Kid Flash to an amusement park where Barry gets the idea to steal the kid's leather jacket because, let's face it, he's really fond of his badges. "Says me, Jerkface!" -actual line from the next panel. After a quick run-around the park, Barry is able to gain the upper hand by using caramel apples, fun house mirrors and, yes, even cotton candy. Barry then hopes that Everett knows how to stop running but putting a concrete wall in his path. Everett is traveling so fast that he vibrates through the molecules in the wall and is quickly apprehended. Now the name "Kid Flash" is sullied forever. The thing about these comics based off of TV shows is that everything is terribly off-model. It's strange seeing The Flash in a rubber-based suit instead of just simple skin-tight one. It's also strange seeing an odd-looking John Wesley Shipp and his early nineties pompadour instead of the Barry Allen we all know and love. How does he squeeze all that hair into the suit's cowl?